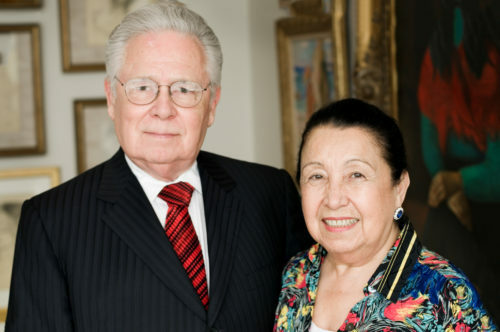 Law School graduate Joe Long ’58 and his wife, Dr. Teresa Lozano Long, have been honored by the University of Texas System with the Santa Rita award, the highest distinction the Regents can bestow. The Santa Rita award is conferred on people or groups who have a record of commitment to furthering the purposes and objectives of the UT System and to serving as the highest example of selfless and public-spirited service. The award has been made only 25 times in the past 50 years. Joe Long worked for the Texas Attorney General’s office before opening a private practice focused on providing legal counsel to banks. He eventually became a banker himself. For decades, Joe and Terry Long have been among the most dedicated and generous supporters of the University of Texas in general and the School of Law in particular. The Longs are the founders of the Long Career Launch program, which provides stipends to recent graduates who are looking for work, and they have endowed scholarships at the Law School for deserving students of merit, as well as endowing a faculty chair. Prof. Tom McGarity is the current holder of the Joe R. and Teresa Lozano Long Endowed Chair in Administrative Law.